For many cannabis entrepreneurs, it probably feels far too early to be discussing exit strategies. But establishing a roadmap to cash in on all your hard work and eventually step away from the business – or at least its daily operations – is an important aspect of long-range planning.Developing an overall exit strategy is also a critical aspect of the fundraising process, as investors want to fully understand how they will realize a return on the money they pump into companies. So what types of exit strategies are most common among entrepreneurs seeking money? 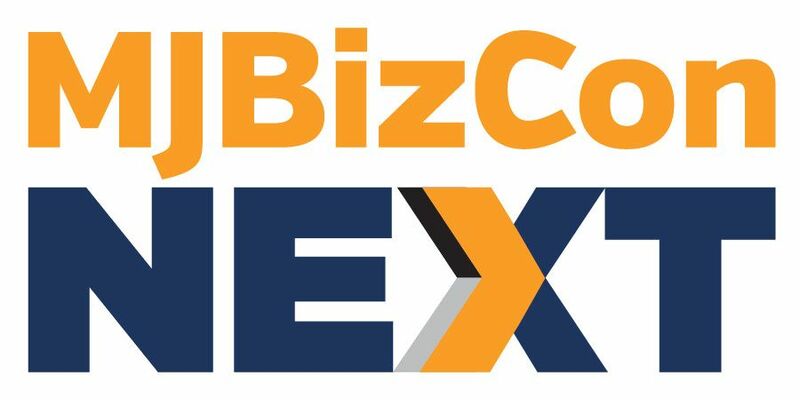 Marijuana Business Daily analyzed 55 applications submitted by cannabis entrepreneurs in the U.S. hoping to be selected to participate in a mock investor pitch contest at the upcoming Marijuana Business Conference and Expo in Las Vegas. The applicants were asked to provide basic financial and operational data as well as state their desired exit strategy. The top choice: an acquisition by another company, with 44% of applicants reporting this as their end goal. Circumstances can vary, but generally an acquisition results in a fundamental transformation of an enterprise, new executives and a new corporate vision. Because of this, an acquisition can be a great way to align the interests of both entrepreneurs and investors when it comes to an exit strategy. Interestingly, however, the second most common exit plan is essentially the opposite scenario. Nearly a third of cannabis entrepreneurs indicate they want to maintain ownership and control of the company and grow profitable enough to pay off loans and/or start issuing dividends to shareholders (investors). This strategy is more popular with cannabis-touching companies such as cultivators, processors and retailers. An average 75% of applicants in those sectors indicate their goal is to provide investors a positive return but also keep running and growing the business. None of the applicants in these sectors expressed a desire to take their companies public, likely in part because there are still many legal issues and risks tied to offering the public shares of a company that handles marijuana. 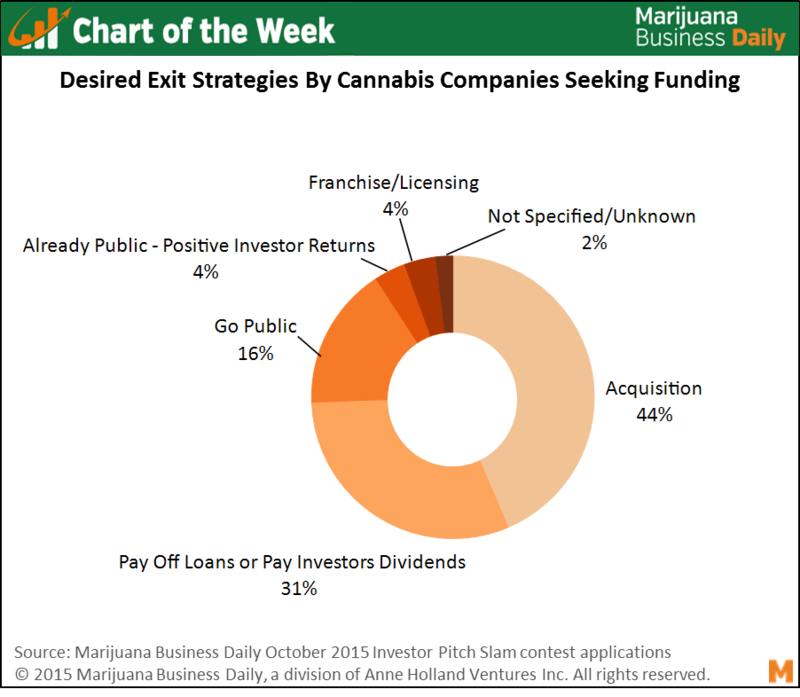 On the other hand, entrepreneurs at ancillary cannabis businesses – both services and technology/products companies – are clearly more interested in the possibility of a big, headline-grabbing exit, with 24% and 11% of ancillary services and ancillary tech and products companies, respectively, expressing a desire to go public. Infused product makers buck the trend among plant-touching firms, with 33% of applicants in this sector expressing a desire for their company’s shares to eventually be listed on an exchange. This may be indicative of the unique opportunities available to these types of companies, however, as they have also generated a lot of buzz by being some of the first cannabis companies to expand into multiple states. Going public is not without its risks though, as recent events at a prominent testing lab demonstrate. Ultimately, no particular exit strategy is inherently better or worse than another. Selecting one really comes down to factors such as the owners’ preferences, corporate objectives, capital requirements and type of investors involved. “Entrepreneurs really need to understand what the options are [to exit] and what issues they will be dealing with for each of those scenarios,” said Patrick Rea, founder and managing director of CanopyBoulder, a cannabis startup incubator. However, one thing is for sure – entrepreneurs hitting the fundraising circuit need to have a defined investor exit strategy, or else they risk getting passed over on what may otherwise be a fantastic investment opportunity. It is never too early to begin discussing or having a well-planned dynamic exit strategy in place. As an investor, your alarm bell should be sounding if you are considering an investment in which this strategy is not clearly defined and includes several options as a strong part of the businesses DNA. Well defined exit strategies should also include transitional elements that deal with how ownership intends to insure that the best leadership as well as advisory elements are in place prior to their being needed. Too often you hear of sad stories about founders and CEO’s failing to grasp the importance of this process as well as expectations of investors then being pushed out or aside because they did not properly plan for proper growth or an orderly exit. As someone once said in a past popular movie the ‘Ruskies’ don’t take a dump without a plan.